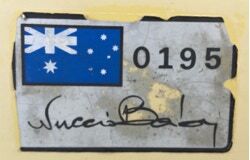 The stickers were first introduced on the 1978 Series 1 “Series Special”. This also happened to be the first year the X1/9 was sold into Australia. As RHD versions only started to become available by mid-1977. Each dealer was given a batch of stickers to place on the car at the dealership or the buyer would get the sticker and place it on the car themselves. This means there is no relationship from sticker to VIN. The only relationship is the dealership itself. The stickers continued to be placed on X1/9’s till late 1981 I would say only by one or two dealers as you don&apos;t see it often on the later models. This was probably old stock of stickers as they made more sticker numbers then actual Series Specials imported. There were many reproductions made by enthusiast over the years. None of the copies looks like an original. Below are a few examples of how to tell the difference. Here are a few examples of reproduction vs original. Sorry about the blurry images I don&apos;t have better at the moment. You need to look closely to see the subtle difference. In this case, corner graphics are not the same. You can see the thickness of the lines on the edges is variable on each of the reproductions. The angles of the curves on the corners are different as well. These two flags are original, but the bottom one is faded by the sun. Most originals are very faded by now and uncommon to see still attached to the car. If you look carefully, I have placed a small circle on the union jack. The original has a distinct gap of white. The reproductions have a minimal gap. The correct location is above the ladder decal on the passenger side. As pictured above on this Green Series 1. There should be no sticker on the driver&apos;s side or any place else on the car. The sticker on the orange series 1 is also an original. 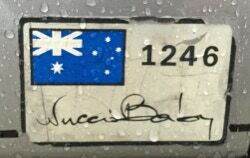 However, the dealers in Tasmania placed the stickers below the ladder decal. Not sure if this was on purpose or they did not follow the correct procedure.